BoldBrush — Instructions on how to clean up an incorrectly formatted page. There are several reason why your website page may not be displaying properly or may become difficult to edit. Websites are built using the language called html. Html is used to ensure that your website will function properly and look good in ALL internet browsers and on all desktop computers and mobile devices. Working with html is not like using ANY word processing program you are familiar with. The edit page has no width or height parameters. The edit page is not the same width as your website page. When properly formatted, page content will reformat itself to fit any size viewing screen (from a large desktop monitor to a teeny tiny mobile device screen). When formatting text for the web, it is best NOT to use functions that work in a word processing program. copy and paste clean text from a Text Edit (Mac) or Notepad (PC) document. This will allow the global formatting of the FASO system to take over and will make sure all text is consistent. You can then format your content using the text formatting icons, located above the text edit box, (bold, italic, center, align). Same for images. Insert them normally, then if you want them centered, use the center align icon. Be sure to preview your web page live on the web BEFORE applying any formatting. Ultimately you can use the Full Screen Mode editor to change font size and font color. It is best to NOT add images and/or text side by side unless you have an advanced understanding of HTML code. If you attempt to force images side by side, they may not display properly on a small mobile screen. If you need to create a list, use the Unordered List icon found in the FullScreen Mode editor rather than forcing an indent with your space bar key. The best thing to do is start with a clean page and fresh text. You will lose all the formatting, but it will be clean text. Formatting can be reapplied and images reinstated once all the extraneous code has been removed. Use Text Edit (on a Mac) or Notepad (on a PC). This will create a plain text document stripping all formatting code and links. We highly recommend keeping the original page open in a separate tab or browser window as a reference until the process is completed. Make note of any photos or links added to text area as they will need to be reinstated after text is cleaned up. Paste (Ctrl V) content into a Notepad document (PC users) or a Textedit document (Mac users). Correct any line spacing issues in the plain text document. - Use the backspace key to pull the text together into complete sentences. - Add paragraph spaces where needed. We have custom designers on staff who can clean up code on a page you've formatted. 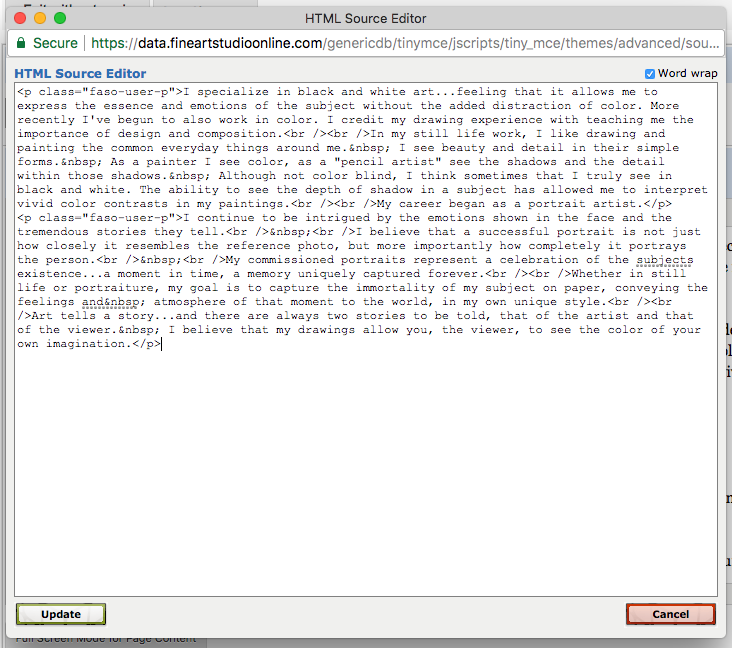 copied and pasted text into a text box from another source (Microsoft Word is the worst), and now you need help cleaning up the HTML code hidden in the page. If the project can be done quickly and easily, we'll make corrections at no charge. If it's more involved and time-consuming, we will need to charge you the custom work fee. Custom work is available for paying members. It is billed at $50/hour, pro-rated into 15-minute increments. The minimum charge is $25. Custom changes can take 10-14 days to schedule and complete. How do I add an image to my Event?